Mumbai is a place of Dreamers. People often visit the city to fulfill their dreams. Apart from career options. There are lots of other attraction in the city for travelers . One such thing is Mumbai Worli Sea Link officially known as Rajiv Gandhi Seal Link . 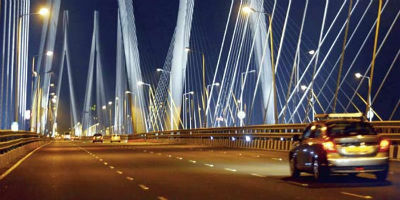 It is an engineering marvel structure connecting worli to Bandra. In the night Mumbai Worli Sea Link is brighten with lots of lighting that make the bridge a must watch place for visitors. The lights are fixed in such a way which light the bridge at highest point. This lighting gives the feel likes millions of various colors stars are sitting on the bridge. This new lighting system is designed using Philips Color Kinetics products which is the cost effective, durable and energy saying options . Lighting solution does not disrupt the surrounding high rises, can be controlled remotely, and can be customized for light shows. Philips Color Kinetics LED lights withstand the area’s corrosive salt air and can be seen from all sides of the bridge. 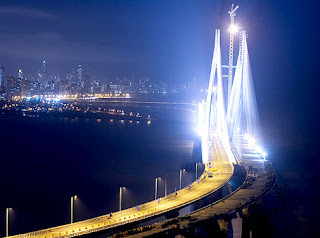 The Mumbai Worli Sea Link is open for traffic in the year 2009 and now it is not less than any world's popular bridge. If you visited this bridge before or if you are are Mumbai resident so don't forget to share your thought and stories about this bridge in the comment sections.